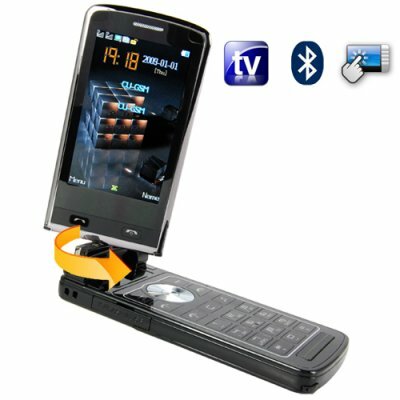 Successfully Added Quad Band Touchscreen Flip-Phone w/ Dual SIM, TV, Accelerometer to your Shopping Cart. Quad Band 2.8 Inch Touchscreen Flip-Phone with Dual SIM, TV, Accelerometer. We're proud to bring you this elegant dual SIM, quad band flip-phone with TV and accelerometer that has all the premium features you would expect from a deluxe cellphone and much more. A wonderful new mobile phone for work. play or any part of your interesting life. Second, this a Dual SIM mobile phone meaning that you can insert two SIM cards into this phone. The benefit to you is that you can make and receive cell phone calls from either one of the two different cellphone numbers associated with the SIM cards. This is very convenient for business travelers whose frequent travel takes them from one country to another. Why carry two phones, when one will do - especially one that looks and feels as good as this one. Beautifully designed and purposefully constructed, this elegant quad band, dual SIM, flip-phone with TV and accelerometer comes with a vibrant 2.8 inch touchscreen. Allow us to repeat that just in case you missed it: this world phone has a touch screen! Launch programs or choose menu items by using either the keypad or the wonderfully responsive touchscreen. The choice is yours. Next, let your eyes take in the polished black exterior and elegant metal textured cover. Flip the touchscreen and lay it down. There, you've just transformed this clam shell design flip cellphone into an iPhone-like tablet phone. How cool is that? What about features you ask? We're especially proud of this phone's feature lineup which brings together everything you need and want in a great cellphone. This wonder-phone comes with a digital camera, video recorder, video player, audio player and receives analog TV and FM signals making it an excellent media station. Flick your wrist and the accelerometer motion sensor lets you change your wallpaper, switch mp3's, and even read the next SMS message. Load some movies and songs into the phone by USB cable or microSD and suddenly you have a party on your hands. WQVGA resolution and stereo speakers will ensure that your media looks and sounds its best. If you love features and great looking cellphones as much as we do, you're sure to be satisfied with the CVDQ-M43. This amazing cellphone is sure to sell out quick so buy one for yourself right away and then let your online customers in on the secret too. Brought to you by the leader in wholesale direct from China electronics - Chinavasion. No, this phone is better than the iPhone! Unlike the iPhone, the M43 comes fully unlocked and ready for use with any network or carrier straight out of the box. You do not need to use any firmware hacks and risk "bricking" the phone. The M43 also has dual SIM and video recording functionality (unlike the iPhone) and doesn't require a firmware update to send/receive MMS messages. Is this phone like the Chinese HiPhone, APhone, SciPhone and or Chinese touchscreen phones? No, this is better than all of them. Unlike with other Chinese touchscreen phones, the M43 comes with a full 12-month warranty from Chinavasion along with a professional in-house customer support service. You can also be secure in the knowledge that your M43 has gone through rigorous QC testing before it is shipped direct to you. How many phone book contacts can this cellphone hold? This phone can up to 600 contacts. 200 contacts for each of the two SIM cards, and another 200 in the phone memory itself. This phone comes with 10 default ring tones featuring famous songs like the Theme from Mission Impossible and The Pachelbel Canon. Or you can easily use your own music track as a ring tone. Better yet, use the sound recorder function to record your own voice and use that as your ringtone. What is the purpose of the rotating touchscreen? A rotating touchscreen is convenient if you want to take pictures of yourself and by twisting and laying it flat, you can transform this unit into a iPhone-type mobile phone. It says this cellphone comes in polished black. What does that mean? To get a sense of polished black think about a black grand piano and how the wood finish looks like. That's polished black. How do I record phone conversations with this phone? While you are in conversation, the menu will display a record option. Once you're done recording, simply activate the sound recorder program and play the file you just recorded. Bought this phone for my son 6 months ago, everything works well, does exactly what it is intended to do, good strong reception, good sound clarity, T.V works great. Ho già acquistato un telefono come questo. Oggetto eccezzionale. Ne sto comperando un altro. i bought this phone out of impulse which is something i rarely do. i bought this phone on Tuesday got it Friday(super fast). open the box and everything you see in the picture comes in the box. the phone is really cool the top half is the touch screen works great the whole phone works great feels good in your hand and doesnt feel cheap, reception was good used it with att had no problems. camera quality is good , radio works, speakers are loud like really loud the phone is slim and really nice to look at too. the reason i am giving it 4 stars is that my only problem with the phone is that there is no external controls on the outside of the phone. no quick way of getting to the volume or camera you have to open it and get into the menus to do so. the other thing i didn't like was how big the phone is when you open it. its long when held next to your face it extends more than i would like. beyond that the phone is great it does everything that it says in the description TV works great to i was watching the home shopping network on it and it look good. My first order, very pleased with the CVDQ-M43 Quad Band phone. Will definately order again.